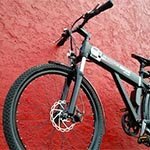 The Easy Motion Neo City electric bike from BH is an ideal bike for bike commuters, especially if your commute is challenging – for example if you are dealing with hills, long distances, or rough urban roads and bike trails full of potholes. And because it’s so comfy, it’s perfect if you just want to get on your bike and ride, without putting on lycra. 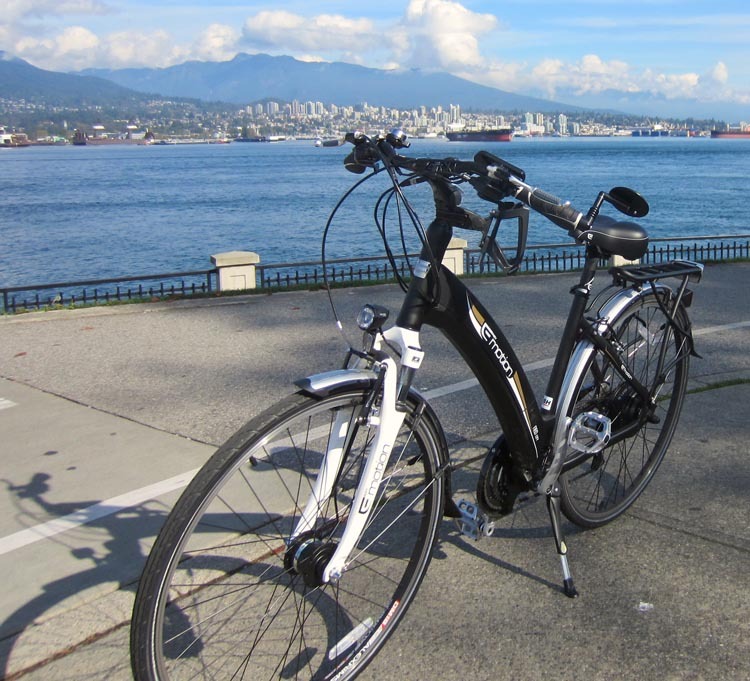 I bought an Easy Motion Neo City electric bike because the roads of Vancouver, Burnaby, and (especially) New Westminster are so bumpy that I was developing permanent tennis elbow (or should that be cyclist elbow?) from riding on my road electric bike. 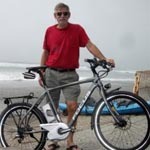 I have an awesome BH Easy Motion electric road bike that I will NEVER give up (regardless of what Maggie – Mrs Average Joe Cyclist – says about the lunacy of keeping three bikes in a small condo). 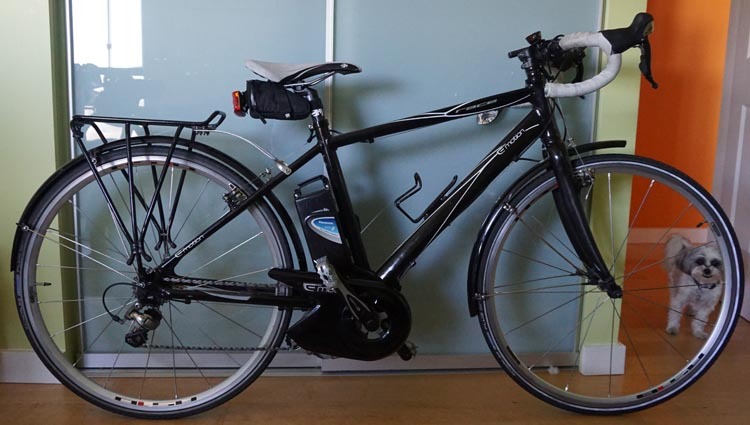 However, the ride on my BH Easy Motion electric road bike is just too stiff to ride it 45 km a day five times a week on bumpy terrain. My elbows are no longer 25 years old! 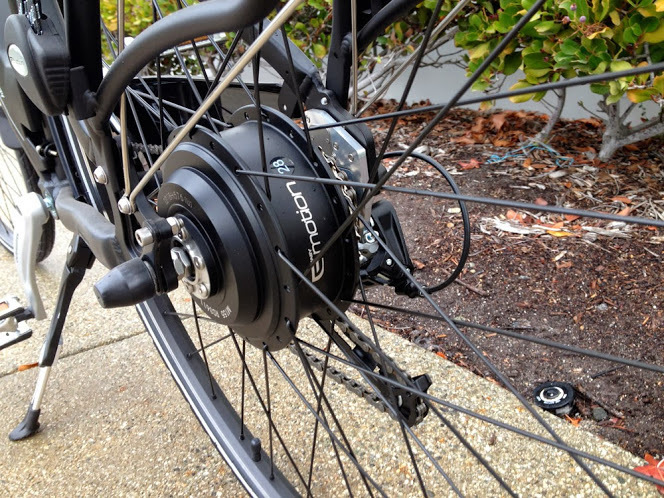 Within one week of switching to the Easy Motion Neo City electric bike, my tennis elbow is gone. And that’s thanks to the incredibly comfy ride. 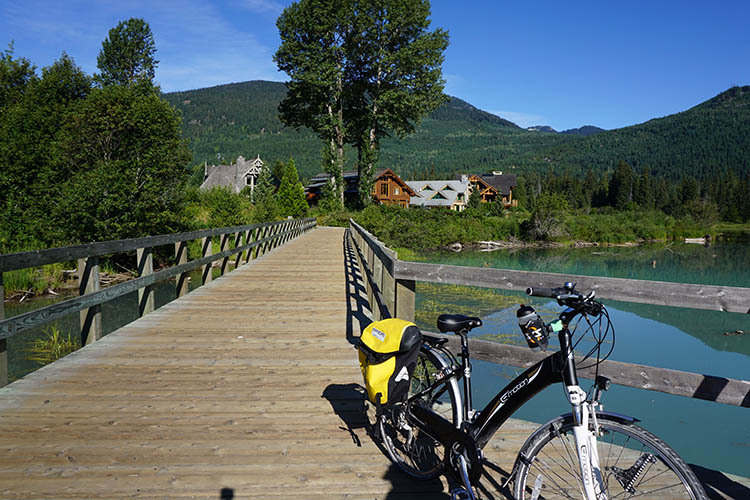 The bike has Suntour front shocks with 62 mm of travel; big wheels (29″ 700C) and smooth-rolling Kenda puncture-resistant tires; a comfort saddle with springs; and offers a relaxed upright riding position. A particularly cool feature is that the stem has a quick release device that allows you to adjust the handle bars to exactly the most comfortable position for you (no tools or techie expertise required!). The Easy Motion Neo City is Just Plain Good Looking! The very first time I took this bike out, a guy who looked like a Serious Cyclist yelled out to me, “That’s a great looking bike!” I take compliments from Serious Cyclists VERY seriously. I got the same reaction from a bike mechanic the first time I took it into a bike store. He also commented on how well the bike is put together, with excellent, integrated components. And this was at a bike store that focuses on regular bikes! I have in the past endured scarcely-concealed sneers from bike mechanics who scorn electric bikes. 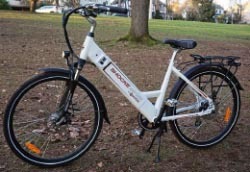 I even went to one bike shop in downtown Vancouver where I am convinced they deliberately BROKE bits of my electric bike. So, coming from a regular-bike mechanic, this was high praise indeed. I didn’t actually NEED anyone to tell me that the Neo City is really good looking. Easy Motion Neo Battery disguised as Not-a-Battery! The lines are sleek, and the styling is integrated and efficient. 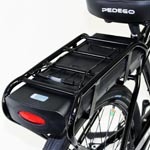 The battery (a Lithium-ion Samsung with 36 volts and 9 amp hours) is cunningly integrated into the down tube, making for a slightly more “stealth” electric bike look, and a balanced weight distribution (necessary on a bike that weighs in at 52 pounds for the medium size, 55 pounds for the large). 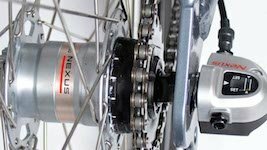 This is the kind of stylish integration that people have come to expect from the manufacturers of the Easy Motion bikes – a company called BH, located in Spain. 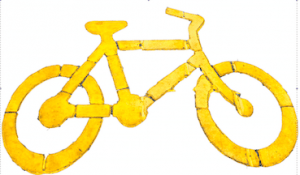 They have been making bikes for more than a hundred years, and it shows. As I am short, I do wish they had a small size. Fortunately, the step-through design means I can still get on and off the bike without a stepladder. 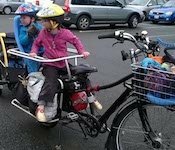 Once on, however, I love the elevated position provided by the medium frame and the 29″ wheels. Reminds me of my teenage motorcycle days, especially with the upright, relaxed position! Is the Easy Motion Neo City Powerful Enough? Assuming you don’t plan to ride up Mount Everest, the answer is a resounding “Yes!” My commute includes the giant hills of New Westminster, and the endless climb from downtown Vancouver to Metrotown, and I do both with ease. 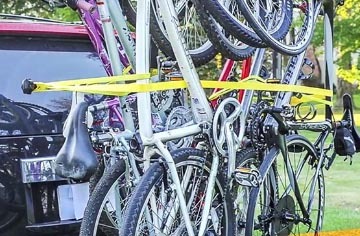 In this post you can see a video I took with a helmet cam while cycling around Stanley Park Bike Trail in Vancouver. Notice that you can hardly hear any engine noise at all. Also notice that I pretty much pass every other cyclist. Although I had to go slower than the bike could handle, for safety reasons. For much of this ride, I was not pedaling at all. I wanted to see how far the bike would go without pedaling. I did at least 20 km that day, and still had plenty of power to spare when I got home. Is the Easy Motion Neo City Versatile? 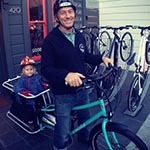 When test riding this bike, my biggest surprise was how easy it was to ride with no assist. This gives it the versatility I need, because I want to be able to keep improving my fitness. I can keep the assist down at zero level for about 80% of my commute without difficulty, and have that great feeling of tired leg muscles at the end of the day. I can also engage either the throttle or the torque-sensitive pedal assist for hills. One of the best things about this bike is that it ALSO has a ZERO level of assist. 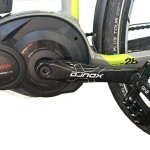 First, this means you can switch into serious exercise mode without having to power down the motor. Second, you have the option of using the throttle assist when you are in zero level assist. When I test rode this bike, I vividly remember the instant that I realized it had BOTH throttle and pedal assist. That was the moment the giant “SOLD!” sign flashed in my brain. I LOVE having both options on one bike. Previously I have ridden throttle-only and pedal-assist only, but never a bike that offered both. The beauty of this is that you can choose what works best for various conditions. 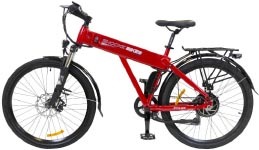 The pedal assist is the best for challenging hills, because it integrates the efficiency of a 24-speed drive-train with the power of a VERY torque-sensitive rear hub pedal assist motor (a 350 watt geared engine). And I do mean very sensitive. The minute you realize you’re on a tough hill and put your feet to the metal, the engine gets on board with you and pounds out the power. Awesome! The throttle assist is great for pulling off, and for sudden bursts of speed (like when a car is too close, or a traffic light is about to turn yellow). 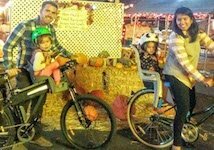 This is one of the great things about electric bikes – I believe they are safer than regular bikes, because you can put in a burst of amazing speed when you need to. I find I have the confidence to be in zero assist most of the time on this relatively heavy bike, because I know I can engage that throttle and be out of harm’s way in a heartbeat. The throttle assist is also great for fine maneuvering at slow speed around obstacles and pedestrians. 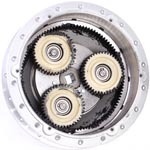 The gears are driven by rapid-fire shifters within easy reach, making it really easy to change the gears. And 24 gears makes it easy to use the bike with no assist at all. 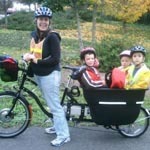 On the other hand, another option is that you can just cruise along without pedaling at all! You can easily do 32 km per hour on a flat road without pedaling at all, just using the throttle. When testing this mode, I was also surprised to find that you can keep going without pedaling over fairly substantial uphills (although of course you slow down). 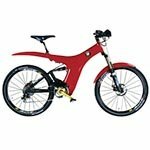 Of course, this would not be the main reason to buy this bike – if I wanted to not-pedal, I would buy a motor bike. But is IS nice to have this option when you are tired or injured – or just want to sit back and feel the wind on your helmet! 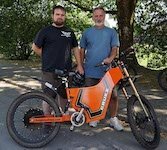 Like many electric bikes, the engine is capped at 32 km/20 miles per hour. (Which I could accept more happily if car engines were also capped at a safe speed). This is built into the software – the engine has the capacity to go much faster, in terms of its hardware. 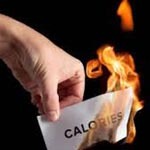 Of course, someone is already working on finding a way around this, but I decided I don’t need it. 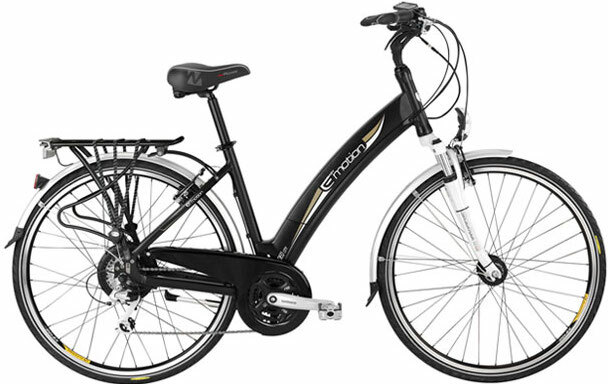 So an unexpected bonus of the Easy Motion Neo City electric bike that it turns me into a very mellow fellow. Maybe a few minutes later getting home, but in such a good mood! 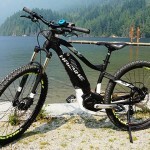 How Far Can You Go on an Easy Motion Neo City Electric Bike? 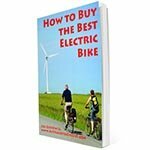 There are so many variables in electric bikes that this is a near-impossible question. 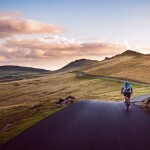 Variables include terrain, weather, your weight, and how hard you pedal. The claimed range from the manufacturers is 50 miles (80 km), but I assume this is for someone who weighs 100 pounds, and is going downhill while pedaling hard! Seriously though, it does have an excellent range, just not as much as 50 miles – not for average cyclists, anyway. I weigh about 170 pounds and my commute includes steep hills, and plenty of them. I can do a 44 km (27 miles) round trip on one charge. But that includes enough pedaling to be tired in the evening. One day I will test it with no pedaling at all, and see what range that will get. I haven’t done that yet because I find it embarrassing to be seen on a bike that is going with no pedaling at all! I may have to do it at midnight. 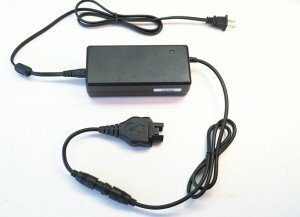 How Long Does it Take to Charge an Easy Motion Neo City Battery? 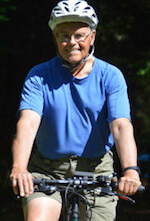 The frame is step-through, making it easy to get on – even when I have one of the injuries I seem to get more and more frequently, the older I get. The LCD computer console is removable for safe parking. I love the fact that this bike has both pedal assist AND throttle drive. It gives me all the options I need for my very challenging commute (which includes tight turns, steep hills, hill pull-offs, and traffic dodging). The full accessories set is great: serious wrap-around fenders with mud flaps; chain guard; ergonomic grips; solid, rugged rear carrying rack; dynamo powered LED lights that stay on long after you stop pedaling; and adequate kickstand (although for even more stability you might want to upgrade it to a two-pronged kickstand at some point, for about $35). All I had to buy were a bell and a rear-view mirror. The wires and cables are integrated into the frame so that they are safe. It is impossible to get caught without lights. The built-in lights (powered by a dynamo in the front hub) are quite powerful and very visible. The rear light is always on. The front light has an on/off switch. I leave it permanently on. I am not sure why anyone would want to switch off a free light on a bike. Even during the day, vehicles with lights are much more visible. That’s why compulsory daytime lights for cars were introduced, after all. However, I don’t think these lights are adequate for riding in pitch darkness. However, this is easily overcome by adding in a bright helmet light, such as my LuminTrail Headlight (reviewed here). It comes with mechanical V-brakes. Disk brakes would be better. 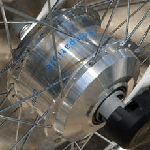 These have been replaced in the 2015 model with disk brakes – huge improvement. I would have preferred lockouts on the shocks. However, the rebound adjustment has proved to be adequate. I don’t feel as if I am sacrificing forward propulsion for bouncing up and down. 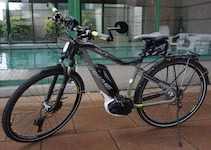 Also, I notice that with my other electric bike that has lockouts – I never use them! I paid less than $3,000, WITH tax, for this bike. Before I bought, I looked at a lot of other bikes at a lot of shops, and none came close in terms of rider comfort, power, and price. 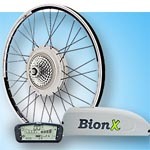 I used to be a devoted BionX fan, and I still believe they make a great product. 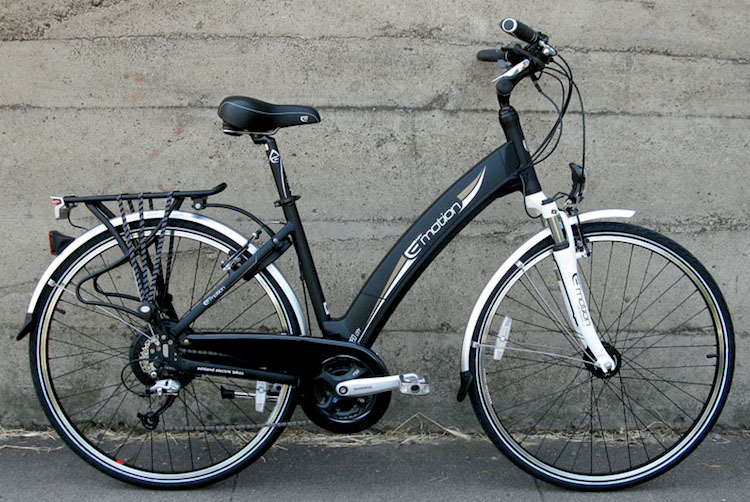 However, the Easy Motion Neo City comes ready-to-ride, in a sleekly integrated commuter cyclist package. It’s not like someone bought a bike and then decided to slap on an engine and some commuter accessories. 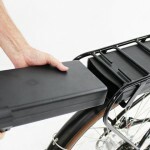 It’s brilliantly conceptualized right from the start as an electric commuter bike. To my mind, it’s one of the best possible electric bikes for bike commuters, and the price point is excellent value for money. No wonder it’s the best seller in the entire excellent Neo line. This bike rates an Average Joe Cyclist Gold Bike Star!